Has it already been five years since the first Stacked restaurant opened in southern California to the joy of many? Congratulations to the regional brand which has found success in five different locations now! A full-service restaurant that focuses on putting choice into customers' hands, Stacked operates in a manner that suits the modern casual diner. Orders are plugged in by the customers themselves via iPad, and every single item can be customized based on one's taste buds. We were invited to check out Huntington Beach's outpost (which we had previously visited for a spring specials tasting) and the menu offered there. Need a casual spot for a large group of friends with varying food preferences? Stacked could be it for you. 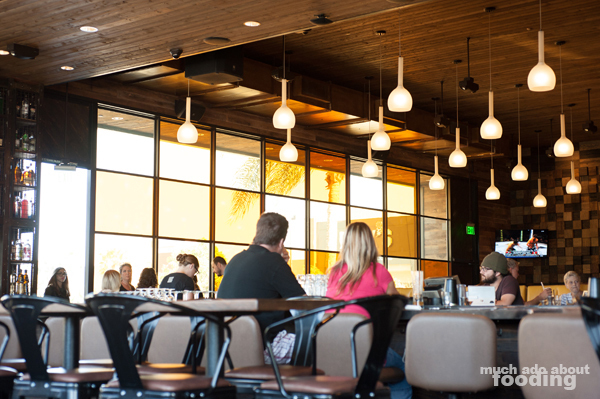 As we mentioned on our last visit, the decor for this Huntington Beach outpost of Stacked is definitely geared towards the local community, highlighting plenty of natural lighting, an indoor-outdoor patio, and reclaimed wood. 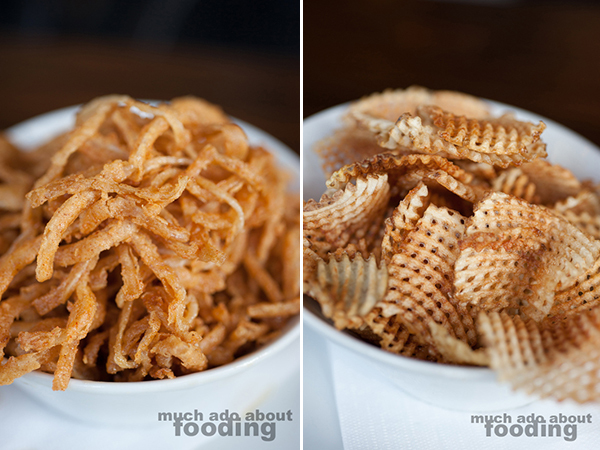 We began the regular menu exploration with their Side Combo ($6.44 - large order of onion strings and homemade potato chips) which allows you options from any of their sides including sweet potato fries, thick-cut French fries, onion rings, and more. Our onion strings were pleasantly sweet though a tad soggy and requiring a fork. It went well with the extra roasted red pepper aioli we snagged on the side. Additionally, their small homemade potato chips were hashed in design and a mix of soft and crisp. 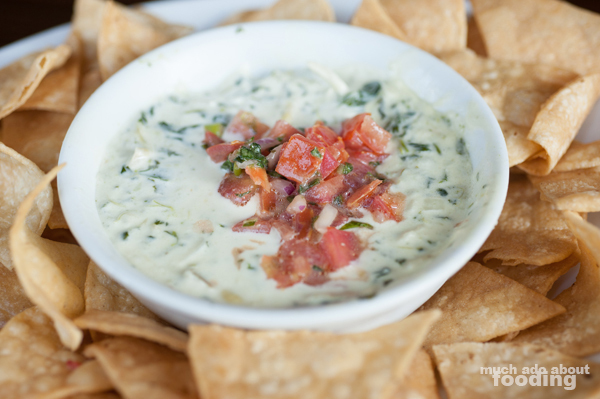 Those wanting a heartier start to the meal might opt for the Spinach Artichoke Dip ($9.89 - spinach artichoke dip and tomato relish) we tried out which was plentiful in its cream cheese base. A bit more spinach and artichoke would have been great, especially with the hefty tortilla chips that accompanied the order. However, there was certainly no lack in savoriness here due to the heavy base. Stacked focuses on American cuisine favorites such as burgers, salads, flatbreads/pizzas, and mac n cheeses. We didn't want to fill up on a burger at the time but did try a bit from each of the other categories that afternoon. 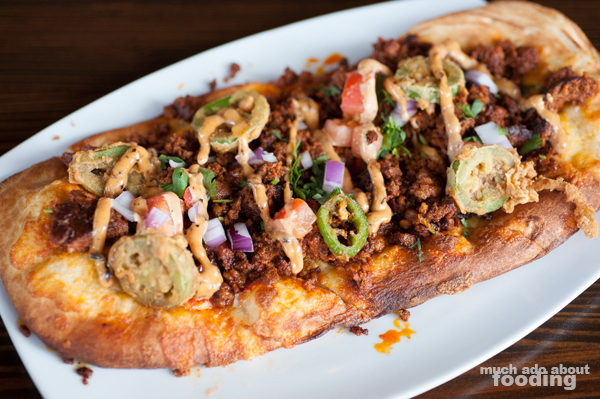 To start, we opted for the Flatbread Mexicano ($8.81 - pizza sauce, Roma tomatoes, red onion, cilantro, chipotle crema, Mozzarella cheese, sharp Cheddar, chorizo, and fried jalapenos) to share as if an appetizer since it was sliced proportionally. For its price point, it wasn't a bad deal and easily could fill a person up as an entire entree. I found the greasiness a bit over the top due to the excess chorizo scattered all over the flatbread, turning what could have been a hands-only dish into one necessitating a fork and knife. The fried jalapeno slices were a nice touch however, and all of the flavors were quite bold for the diner wanting strong combinations. 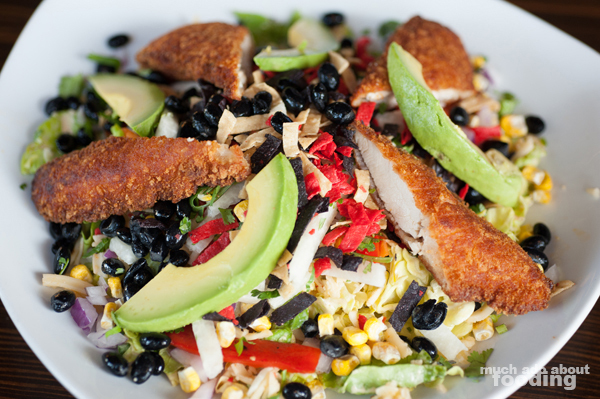 To contrast this, I shot for The Wrangler ($10.93 - butter lettuce, Southwestern dressing, Pepper Jack cheese, tortilla strips, black beans, chicken tenders, avocado, red onion, roasted red pepper, jicama, dried sweet corn, and cilantro) which was a tastefully bright and fresh order by comparison. The jicama and dried sweet corn were great additions to add elements of sweetness and hydrating crunchiness. 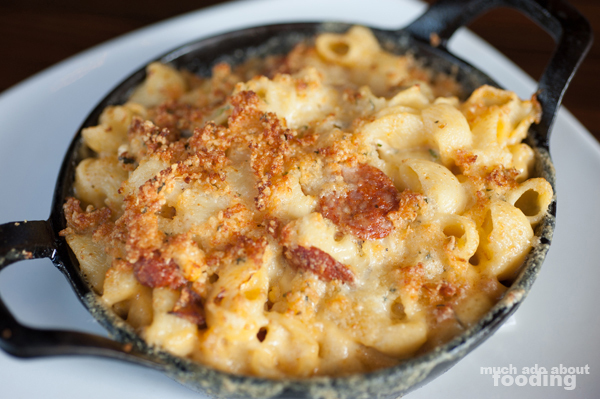 Then, out came the Cajun Shrimp Mac ($16.02 - mac 'n' cheese, Cajun shrimp, roasted red peppers, green onions, Parmesan bread crumbs, and Pepper Jack cheese) to which we added additional Andouilla sausage, hence the higher price point for a mac n cheese dish. This actually was not as cheesy as I had originally expected but still plenty hefty. The crisp bread crumbs on top gave a decent crust to the pasta, and the Cajun shrimp were actually plentiful and done well. Outside of the meatiness, the hot skillet of cheesy shells provided a touch of comfort food to the day. Though practically bursting with food, we wanted to see what kind of customization existed for their dessert options. When you choose to explore these on their digital menu, bear in mind that they usually want you to order immediately. 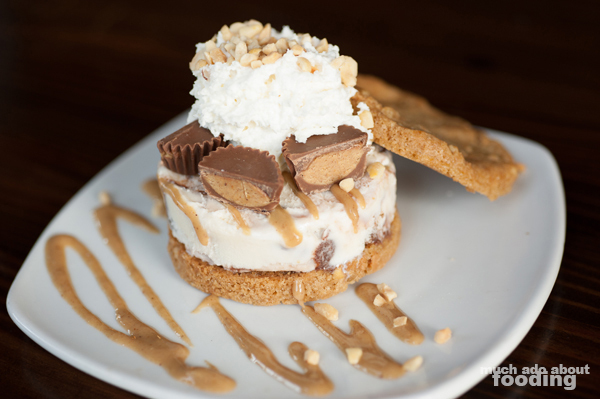 We didn't need to configure the Peanut Butter Heaven ($4.39 - peanut butter with Reese's Pieces cookies, fudge track ice cream, Reese's Peanut Butter cups, peanut butter sauce, peanuts, and whipped cream) ordered because it had everything a peanut butter lover could want. The dessert took a little while to come out but perhaps it had to do with the careful placement of every piece. 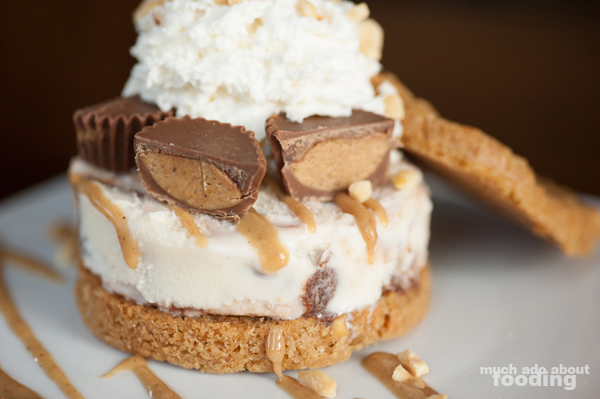 The cookies were delightfully not too sweet, and the inclusion of a non-peanut butter ice cream helped keep the dessert from feeling overwhelming. If you have a love for such indulging, this will serve you well. Find Stacked's Huntington Beach location at 7490 Edinger Ave. and customize your meal to your heart's content, ingredient by ingredient!